Are you thinking about listing your Fort Collins house? If so, you will likely be making some fixes and upgrades to the home in order to get it listing-ready. But not all repairs are created equal. You don;t want to make expensive repairs that offer little to no return. In this blog, we have put together our list of 5 things to fix before you list your Fort Collins home! Even old, damaged, and tired flooring can be dealt with for a relatively low cost. Fix cracked tiles, repair major scratches to hardwood and clean or rip out old carpeting. Even if the floors underneath are nothing to look at, leaving old, dirty and stained carpet is a huge turn-off. If the floors are in rough shape, an area rug can always help to cover up the damages. If you are leaving the carpets as is, have them professionally cleaned to remove any stains or odors you might be over looking. You will want to fix any damage to the roof. Repair leaky parts and any water damage to the ceiling. Water stains on the ceiling and walls can be huge red flags for potential buyers. They will immediately think there could be mold and much bigger problems. Fix these things before showing your house so you don’t scare off potential buyers! The color of the walls can change the whole look and feel of the room. While the consensus says to stick with neutral tones, adding some warmth to a dark and cold feeling room will change the way people feel when they walk in. You want the colors to be warm and inviting. Find a balance between plain and boring and too bold and off-putting. Infuse some personality into the color scheme, but remember you want to appeal to a wide audience, not just those who share your color palette. Wallpaper is seeing a comeback, but not everyone is interested in prints on the walls. If you decide to leave wallpaper up, make sure it is a low-key print that isn’t going to dissuade people from enjoying the space. You can’t say enough about curb appeal. There have been studies done, saying people subconsciously decide if they will make an offer on a home within the first few seconds of seeing it. Your landscaping is your first chance to connect and appeal to potential buyers. For a relatively inexpensive investment, adding some plants and cleaning up weeds and overgrowth, can make a huge impact on how fast your home sells. While bad landscaping might be able to be looked over for the perfect house, it is better to start out on the right foot. Start out by making people want to see more of the house, just by looking at the outside! They say these areas ultimately sell the house. However, it is not necessary to complete major remodels or renovations to make the areas really pop. Small fixes in these spaces can add serious value to your home. 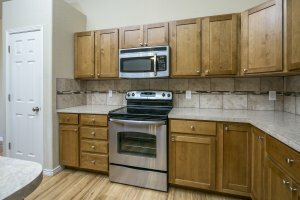 Refinish or paint old cabinets to give them new life. Countertops and even tiles can be resurfaced. You can even refinish your tub and shower. You can also add new fixtures, including faucets, drawer pulls, doorknobs and cabinet handles. Doing these things can make a dated space feel modern and fresh almost instantly! Adding great lighting to the area will help to sell your home. Make sure areas are well lit, and are filled with warm light… nothing too bright or hard on the eyes!